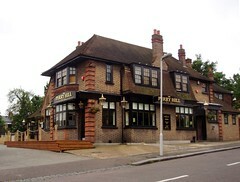 Pub in Catford, formerly known as the Two Brewers. It spent some time as a gastropub around 2008-2010 (see earlier version of this page) but as of 2016 it's food-free aside from the occasional barbecue in the garden. This spacious, airy, bare-boarded pub appears to once have had a division into at least two separate bars, but has now been opened up into a single large space. However, pillars here and there, along with the remains of the old interior walls, make sure there are still some cosy corners to hide away in. One side of the pub looks onto the beer garden, and has a large skylight letting in more illumination. The other side, around the horseshoe bar, is less well-lit and dominated by a pool table. Kake visited on a Wednesday lunchtime in August 2016. There was one other customer when I arrived a little after their opening time of noon. No music was playing, but a quiz show was on the flatscreen with the sound on. Although they do have handpumps on the bar, at the time of our visit they were strongly considering stopping real ale altogether as it wasn't selling. A pint of lime and soda was 40p. According to a sign seen in August 2016, there's a pub quiz every Tuesday. Accessibility: A large step to get in. Once you're in, there's no steps to the ladies' (gents' not checked), but it's a bit cramped in there. Several steps to the garden. Last visited by Kake, August 2016. Opening hours taken from the Perry Hill website, August 2016. Last edited 2016-08-11 16:51:36 (version 7; diff). List all versions. Page last edited 2016-08-11 16:51:36 (version 7).